There’s no gift butter than the taste of fresh baking! Our gift cards aren’t fresh out of the oven like our bread, but they’re pretty new! 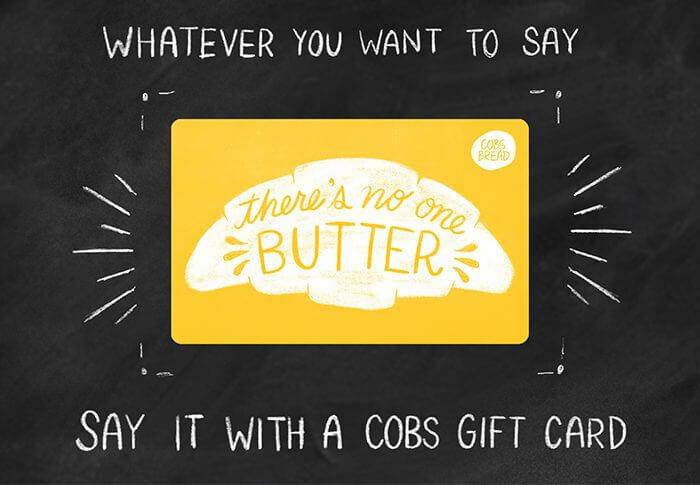 Pick up a COBS Gift Card at any bakery and share the gift of fresh! Treat your staff and clients to the freshest baked treats, without having to put bread in an envelope! Order corporate for any occasion. Register your COBS Gift card to protect your balance if you lose your card. When registering your gift card, use your CVC code as your card password.